My kids right now have so many stuffed animals that if they were all to burst their fluff right now, we’d be chin deep in stuffing. We might not find the four-year old for days. What is it about stuffed animals that calls out to children? Ethan and Olivia have named every one of their bajillionty animals. They view them as more than toys, but as friends. The animals’ wishes are consulted when it comes to things like what to have for a snack or which pajamas to wear. They are cuddled first thing in the morning, and clung to late at night when the lights go out. stuffed animals are largely ignored as other flashier playthings occupy their attention. They rest secure in the knowledge that their furry friends will be there, ready and waiting when they are needed. While traveling on deputation we accidentally forgot my son’s stuffed puppy, Broden at a hotel. Talk about wailing and gnashing of teeth! Desperately we called the hotel and lo and behold a sweet maid had found poor Broden and kept him safe. The staff went to the trouble of overnighting us that little sack of fur and fluff. Why bother? Well, because he was unique. And he was loved. They mistook his gentleness with them for domesticity. We do this to God a lot in our lives I think, trying to treat Him like a child’s stuffed animal. He’s great to have around when the darkness feels scary. We’re happy to get his opinion on things when we know He won’t disagree with us. And we like knowing that God’s hovering there in the background of our lives while we do all the oh-so-important jobs that consume our days and our attention. But we forget that He is not a tame lion. We’ve gotten the relationship all backwards. He is the master, not us. We cannot fit Him into a box, or even a cuddly stuffed animal coat. His ways aren’t soft and cuddly. He demands things from us that can be hard to give. But the most important thing is that He doesn’t demand them arbitrarily. You see this is another place where we’ve gotten things backwards, we often talk about our spiritual journey, about finding truth or finding salvation. The truth is that we were lost, but God sought us. Desperate to rescue us from oblivion, He overcame the world for our sakes. He is not tame. He is our hero. And He did it because He created us each uniquely and we are loved. Did you have a special stuffed animal growing up? Do you still have it? What sorts of memories does it conjure? I had a blankey. My second child, Jonny, has a dog named rascal. Can't imagine the trauma of leaving him at a hotel. I love the spiritual tie in here. In my non-fiction, I talk about the fierce mother lioness as an image for God, because there we can really see both sides: the loving nurturer and the wild protector. I also use the "can't put God in a box" idea a lot. Interesting thoughts, Lisa. I have to think about this for awhile. I really don't think I look at God this way but I'm going to examine how I DO relate to Him, given this example. Great post Lisa. You can pretty much take any subject and find a way to show us God's nature. I told my daughter (the teacher) what your son said yesterday about 'quitting school'. Hi Lisa. Great analogy. I love this! I didn't find Jesus, he found me. I love your way of thinking. My son had a blue stuffed bear. Bear-Bear went everywhere with us, even to the dinner table. He was so loved, his fur was rubbed bare. At one point, I actually replaced Bear-Bear. My son was smart, and he was suspicious, but I convinced him Bear-Bear had been made new. I still have the original Bear-Bear, and I keep him in a plastic bag. My son is twenty-seven now, but even after all these years I can take the bear out of the bag and still smell that sweet baby smell that my son smelled like when he was little. Hey Dina and Deb, thanks for your comments. Not everyone falls into the trap of thinking of God as cute and cuddly, but I think some people do prefer to think of Jesus as a babe in the manger rather than tipping tables in the temple. The focus is different, but the desire to define God is I think pretty universal. We can't comprehend infinity, so we latch on to a single facet of God's character and act as if that is the whole. God is a judge. God is love. God is healer. God is jealous. He's all those things and so much, much more. The longer I know Him, the less I realize that I know. Aw, Suzie! I love that story. I bet you'll have to turn it over one day to its rightful owner! Lisa, I loved this post. Beautiful analogy, and so fun to read. God is jealous, mighty, powerful, infinite...and gentle and tender, too. It will be amazing to be in His presence someday and have all of forever to praise Him for His attributes. Boy, does my family have stuffed animal overload. And like you guys, all our little furry friends have names and, dare I say, personalities. Someone in my house also has a blanket which is no longer square or yellow, but it's the most loved object I've ever seen. I love my sock monkey, but my favorite stuffed animal is Ernest, a pig my husband (then boyfriend) mailed across country to me while I spent a month doing a poetry workshop. Ernest is just sweet. Yep, Suzanne, stuffed animals definitely have personalities. Ours can be downright ornery when the mood strikes them. I think they may have been playing with the children too much. But I have to say that sock monkeys creep me out. We will never have a sock monkey! Lisa, this is adorable. 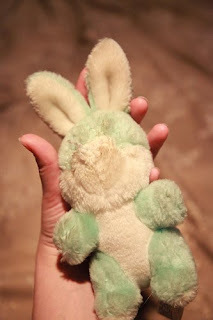 I have so many stuffed animal tales I'd have to do my own post! My husband often uses the Toy Story analogy for our belonging to God. The way Andy wrote his name on his toys, God writes his name on us, and we know that we are loved. As for stuffed animals... I used to go in the toy store and rearrange all the animals so they could "breathe." Frequently did the same on my bed. And my kids have so many stuffed animals (none of which we can get rid of) they are "hibernating" in plastic bags in the crawl space. "He is not a tame lion" is quite possibly my favorite line from the whole movie! Niki, I do the same thing. All the stuffed animals need to breathe-- and of course, love and respect. Susie . . . so true! To be in the presence of a lamb that's a lion, a leader that's a servant. The creator of all and the closest friend. How can we even begin to guess what it will be like? Loved your analogy. CS Lewis was a genius in his allegorical depiction of Christ and your depiction of us, as children with our stuffies is brilliant. Thanks, Wenda. I thought of all kinds of other ways to extend the analogy, but decided not to push it and muddy the waters! And you're right C.S. Lewis was an absolute genius. Do Canadians in general call them stuffies or did you pick that up somewhere else? My mother took my last stuffed teddy bear away when I was 10. I had a very difficult childhood and didn't always have a bear but when I did, it was my reassurance that all was right with the world. I'd snuggle it in my arms and the tip of my nose would caress the soft inner ear. The fur inside the teddy bear's ears was always so soft. I'd fall asleep that way. I remember a couple times getting a new bear for Christmas and my old one with the bare inner ears would just up and disppear. I'd cry for days, using my new bear to comfort me. These habits are hard to break. I know because just a couple months ago when we were cleaning out my daughter's room, I picked up her teddy bear and without a thought, I held it to my nose and gently rubbed. My boys stared at me like I was nuts. But it was just so natural to me. BTW my MIL wanted me to know yesterday how much she enjoys your posts. You're her favorite writer at the Inkwell! Awh, Lisa, I appreciate you telling me. That really makes me feel blessed because my posts aren't profound like the rest of the Inkies write.